The Atlantic sturgeon is an iconic species for the Hudson River -- so much so that it serves as the logo on the signs that note the river's estuary. And sturgeon have long held a place in the history of Albany. It was a favorite food in this area going all the back to the Dutch times and came to be known as "Albany beef." But the sturgeon's history runs waaaay longer than that. "They're some of the most ancient fish you're going to find in New York," says Jeremy Wright, the New York State Museum's curator of ichthyology, explaining the only types of fish in New York that are older are jawless fish such as lampreys. As a species sturgeon date to the Mesozoic Era, more than 60 million years ago. Yep, they were contemporaries with dinosaurs. They look ancient, too. Atlantic sturgeon in the Hudson River sometimes grow to 6-8 feet long and more than 200 pounds. (They can get even bigger in other settings.) They have a long, pointed snout. And they're covered in bony plates. "Anyone who's seen one is never going to forget what a sturgeon looks like," says Wright. "They're really distinctive fish." Unfortunately, recent history hasn't been kind to sturgeon. Overfishing has greatly diminished populations of sturgeon species both in the Hudson River and around the world (that 1881 Albany beef NYT article linked above notes that even then demand was outstripping supply). And they're now considered endangered. In 1998 a moratorium on fishing them was instituted along the East Coast, and it could last until the late 2030s. Part of the problem for sturgeon is that they take a long to time to develop and grow. Sturgeon can live as long as 60 years, and in the Hudson River they don't reach maturity until they're 11-21 years old. "Fisheries biologists talk about this like clear cutting, which I think is an apt analogy," says David Strayer, a freshwater ecologist at the Cary Institute of Ecosystem Studies in Millbrook. "You wouldn't think you could go into a wood lot and cut all the trees every five minutes and expect there to be a forest there any longer. Everybody understands it takes so many years for a baby tree to grow up. It's the same way with the sturgeons. When we started fishing them real hard it was like someone went into the woods and cut all the trees." And now, the hope is, the moratorium will allow the sturgeon population to slowly grow back. By the way: There are two species of sturgeon in the Hudson River: the Atlantic sturgeon, which swims out to sea to feed and return up river to spawn; and the shortnose sturgeon, which is smaller (about 3.5 feet) and spend their whole lives in the river. 1. Their lifecycle includes both the Sargasso Sea (out past Bermuda) and the Hudson River. 2. The juveniles are clear. They look like they're made of glass, thus the name glass eel. "They're beautiful, delicate, little creatures," says the Cary Institute's David Strayer. The glass eels are the juvenile versions of the American eel. Adults eels head out to the Sargasso sea to breed, and then their larvae are swept by currents back toward the east coast of the United States. 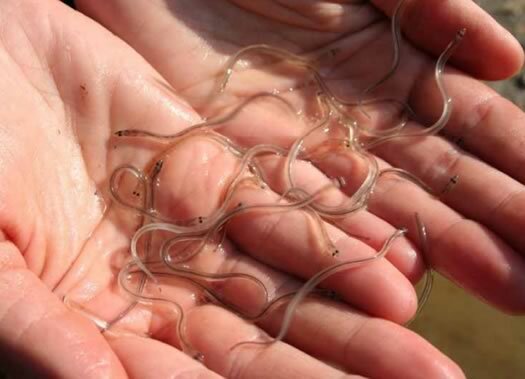 The juvenile eels then make their way up rivers, including the Hudson, and into tributaries where they grow. That's a bit odd -- usually fish, like sturgeon or salmon, breed up river and then head out to sea to feed. Another thing you might not expect: Eels can climb up waterfalls. 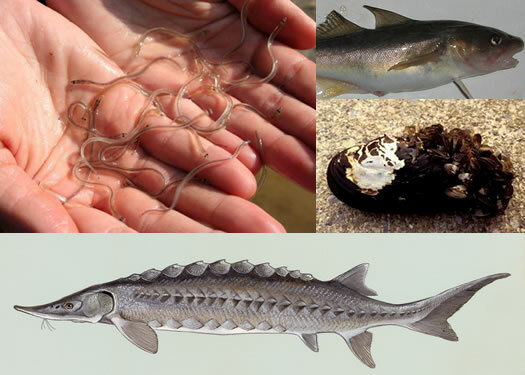 If you're curious to learn more about the eels, the Hudson River Eel Research Project has a bunch of information posted online, and a Facebook page with updates about eel research and events (you just missed this year's "eelabration"), and there are even opportunities to volunteer to help with research. The Atlantic tomcod is like something from a fish comic book. Because hiding within its DNA was a special ability that was only noticed because of its encounter with a toxic substance. 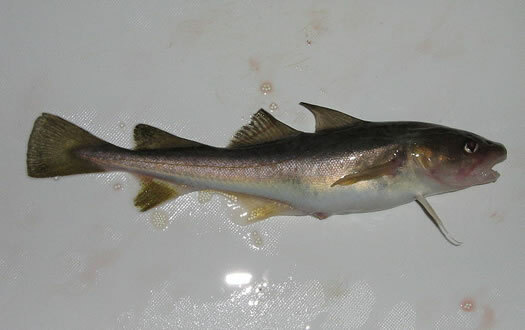 In 2011 researchers reported that some Atlantic tomcod in the Hudson River carried a version of gene that allowed to them to resist the effects of PCB pollution -- which is pretty good ability to have considering, as you know, the river's long running problem with pollution from the toxic substances. "The thought is that when the contamination first occurred, there was basically a sweep through the population that wiped out all these individuals that didn't have this mutation," says the State Museum's Jeremy Wright, explaining that PCBs interfere with the development of the heart and cardiovascular system in the fish. "And that just left the individuals that could handle the increased concentration of PCBs. And then they were the only ones left to reproduce, so the mutation became fixed in the population." Wright says the researchers found that 10 percent of the tomcod in rivers unaffected by PCB contamination carried the genetic variation -- but almost all of the fish in the Hudson and Hackensack (also polluted by PCBs) rivers had it. Says Wright: "It provides evidence that's there really strong selection for this mutation in the Hudson and Hackensack rivers that's occurred relatively recently that's resulted in a major evolutionary shift in this particular gene." At one time native freshwater mussels reigned in the Hudson River. The Cary Institute's Dave Strayer says there were once 12 native species of freshwater mussels in the Hudson near Albany, and some 1.1 billion of them in the whole river. Some species of the mussels lived to be 50-100 years old. "If you look around Albany on the shores or beaches you find still shells, clam shells, and that's what they are, mussels," he says. But now they're on the verge of disappearing. The culprit: the invasive zebra mussel, which attach themselves to the mussels (and everything else) and outcompete them for the phytoplankton they eat. 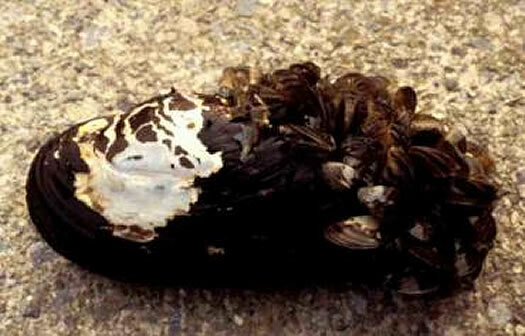 "The zebra mussels are killing them off," says Strayer. "My guess is that they will disappear almost entirely in the next few years because of the zebra mussels." Youtube user Robin Read posted this clip last August, noting it was just north of Coxsackie. One of the defining features about the Hudson River is that it's open to the ocean all the way from New York City up to Troy. And as a result, the river ends up getting some visitors from the ocean you might not expect. "Occasionally people pick up these oddball things in the river -- seals, and whales, and crabs, and things like that that you'd think should be in the ocean," says Strayer. "And there's actually quite a few of these things that make up into the river." There are historic accounts of whales having made their way as far as Cohoes more than three centuries ago. And in the last few years there have been seal sightings in the Hudson River at Coxsackie, as the animals apparently follow food up the river. Here's one from this past May reported by CBS6. Strayer says he heard in one of the sightings, the seal seemed just as curious as the people: "The animal pulled his chin right up onto someone's kayak to look at him." Wonder how far in stream sharks could thrive in our Hudson River? How would one go about luring a family of seals to relocate to Troy permanantly? I'm totally asking for a friend. mg, I'm not sure if the Hudson is salty enough for most sharks as you go north from the Ocean. Bull sharks can live in fresher water though, and have been known to swim thousands of miles up the Amazon, so no reason they can't be here, though I guess they'd have a tough time getting further than the Stillwater dam or so. I think it's generally younger bulls that venture into freshwater rivers, so of any reasons not to go in the Hudson, sharks probably aren't high on the list.